Today we are going to build a registration system that keeps track of which users are admin and which are normal users. The normal users in our application are not allowed to access admin pages. 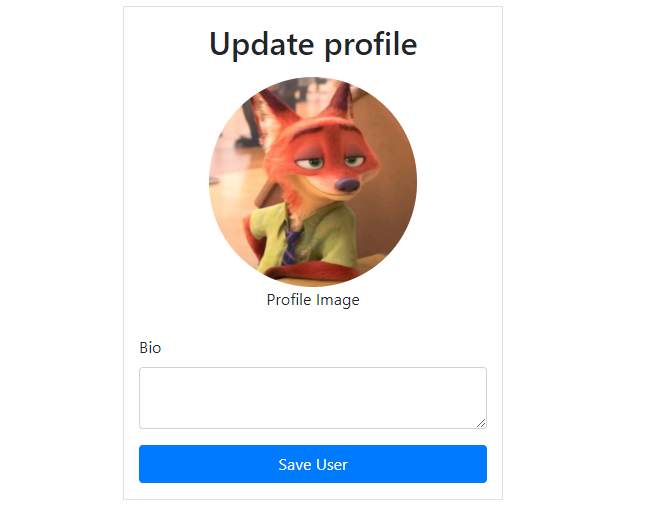 All users (Admins as well as normal users) use the same form to login. After logging in, the normal users are redirected to the index page while the admin users are redirected to the admin pages. Note: The first part of this tutorial is already covered in a previous post on user registration. You can visit this post for a more elaborate explanation of the user registration system. To those who have already followed that post, I apologize for the repetition here. That doesn't look cool. Let's do something about it. This css code will be used for styling our entire application. 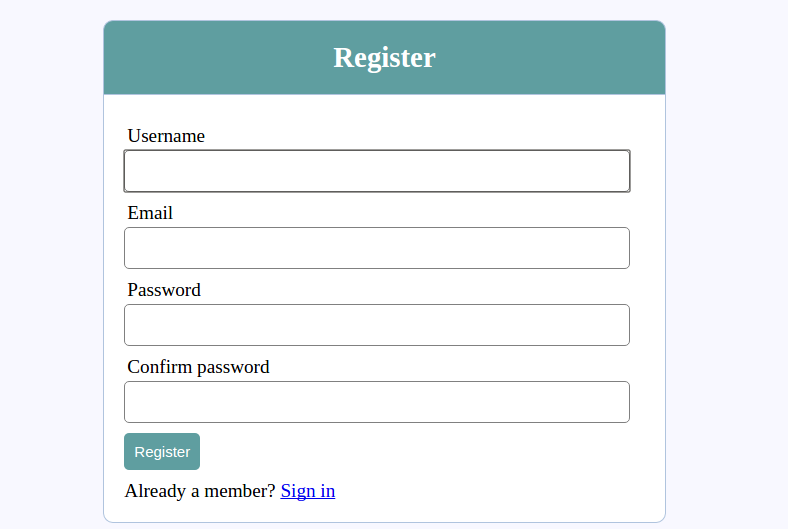 What we want now is for the user to fill the form and press the register button so that the info can be saved in the database. So we move on to the next step. That's all we need for our database. Let's move over to our register.php file once again and do some modifications. First we should make sure the form's method attribute is set to post and that the action attribute is set to register.php meaning that when the register button is clicked, the form values are submitted to the same page. Let's now write the code to receive these values and stores them in the database. But it is my custom to avoid, as much as possible, mixing up php code in html so I'll go ahead and create a functions.php file to put this code inside and then make this code available in the register.php file. The display_error() is a simple function we are going to define shortly. If you observe keenly you can now see the difference between a user and an admin. In the register() function, the user is being saved as admin if the user_type variable was sent in the post request or as user, if no user_type was sent. Since our form doesn't have any field for the user_type, it is obvious that the user we are creating will be saved as user and not admin. When a user is registered, we get the last inserted id (id of the registered user) and log them in. From the user's id, we are able to get all the other attributes of the user using the getUserById() function. After getting the user, we put them in the session variable as an array called user. Storing the user in a session variable means that the user is available even if you refresh and navigate to other pages (where session has been started). The user variable in the session doesn't get lost; it can only be lost by unsetting it (this is how we log the user out. Coming soon...). 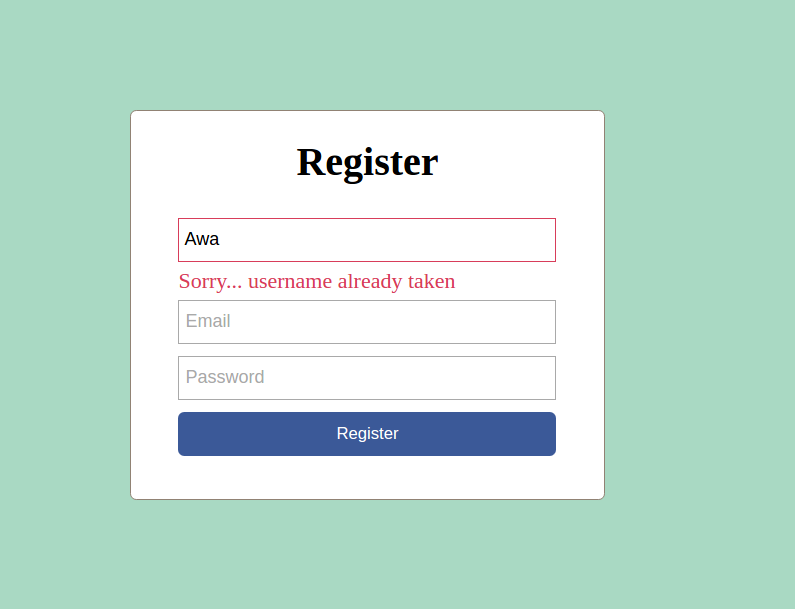 Now back to our registration form, you notice that when you input values and click the register button, you are redirected to the index.php page. But it's blank. So let's make it look like an index page. 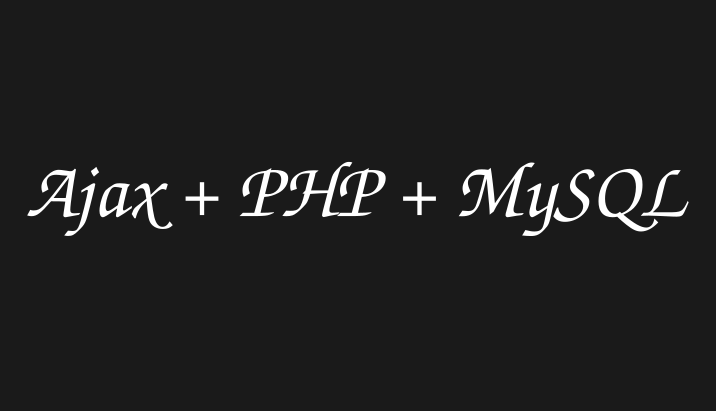 Open up index.php file in your text editor and put the following code in it. Just one tiny problem. 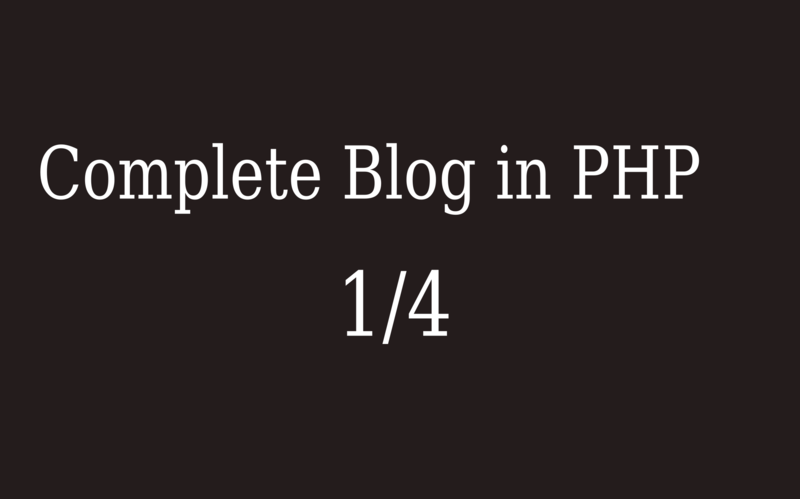 If a person types the right url to this index.php page in the browser, they will be able to access this page without even logging in. 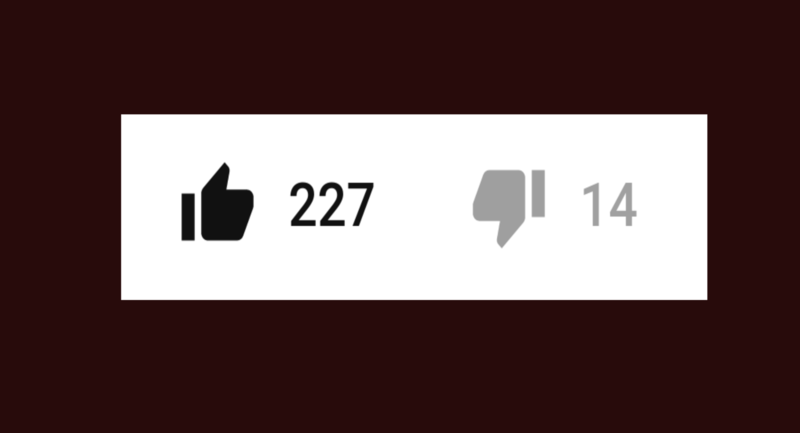 We don't want that right? Let's fix it. This function when called, tells you if a user is logged in or not by returning true or false. If the user is not logged in and tries to access this page, they are automatically redirected to the login page. At this point we can say we are done with user registration. 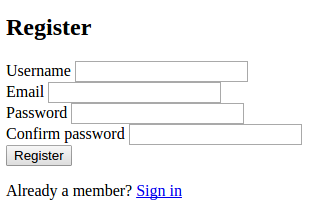 To do user login is even easier. Basically what this does is: if the login button is clicked, the login() function is called which logs the user in. Notice that when the user is logged in, it also does a check: if the user is admin, it redirects them to the admin/home.php page. If however, it is just a normal user, he/she is redirected to the index.php page. Now let's get to work on the admin site. 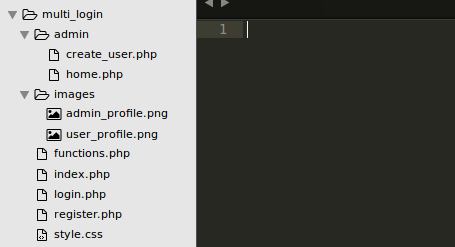 We are going to be using the files in the admin folder (create_user and home.php). These files are available only to admin users, which means only an admin can create another admin. Besides styling, the main difference between this page and the register page is the option-select field in the create_user.php page that permits the admin to specify the user type. Therefore an admin can create a normal user as well as an admin. Now you might say, if only an admin can create another admin, then who creates the first admin. 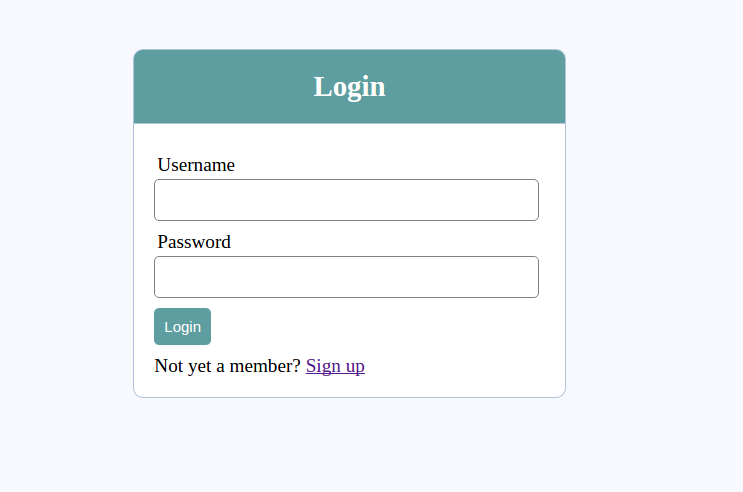 Well to create the first admin, you can create a normal user using the registration form, then use any mysql client like phpmyadmin or the mysql command prompt and change the user_type to admin. That way you will be able to log in as admin and create other admins. As simple as that, we are done with building a system that manages normal users alongside admin users. I hope this tutorial was helpful to you. I am glad you actually followed it through to the end. Feel free to examine the code, customize it to suit your needs and use it in your projects. If you have any issues or comments or any remarks at all about this tutorial, leave it in the comments below.